The whole song acts as one long story, and a heartbreaking one at that. I can’t decide, however, if if this pre-music video recording of the band is a good or bad thing. On the one hand, no one has mucked a pretty awesome song with a terrible video. On the other, that hair–that hair! Sure, the video tells a compelling narrative story, but the lyrics themselves are part memoir, part history lesson, part description. I love that the lyrics work as expository writing, but with the marriage of words and visuals (pun only partly intended)—just as in a good picture book—something entirely different and more interesting is created. Okay, so maybe I don’t personally find this one all that persuasive, but the object of Nelly’s affection seems entirely swayed by his suggestion that “it’s getting hot in here, so take off all your clothes.” Indeed, she seems to find it a singularly good idea and immediately complies. And, hey, just because it doesn’t persuade me doesn’t mean it doesn’t work for someone else. And that’s what I’m thinking about on this steamy Friday afternoon. For indeed, it is getting hot in here, but unlike Nelly’s lass, I’ll keep my clothes on as I work, thank you very much! Clearly, I don’t mean literally—Trigger here can rest at ease. The sacred cow of which I speak is a piece of my own writing. It’s a piece that I wrote ages ago, but couldn’t let go of for some reason. I thought it was a short story, but then it evolved into the prologue of a young adult story that’s now over 40,000 words and still growing. I love these few pages of writing, and have held them dear for a long, long time. However, it occurred to me a while ago that if I was going to revise this manuscript, and revise it to any real effect, anything and everything had to be up for grabs. Which meant that I had to look even at this prologue and see what needed to be done to make it better. In my innermost heart, however, I didn’t think it could be better. Love can blind you, even when it’s love of the words on the page. So, I went into revising this with serious doubts about it. I had an idea—an experiment that might prove interesting—and decided to just give it a try. It turns out that slaughtering your own sacred cow is no small or easy task. It also turns out that it can make a story much stronger, much more readable, much more emotional—and make much more sense. This was an incredibly useful lesson, on top of being a much better revision than I ever imagined it could be. I guess in some spheres of life, nothing is sacred after all! Even the best laid plans—made with the very best of intentions—can crumble into pieces when you least expect it. The plans I had for this week fell victim to…well…life. They were good plans, too. Revisions for upcoming school workshops. Reading for my upcoming residency. Home improvements galore. Running longer and faster than ever. You name it, I had it planned for this week. But when you make plans, the gods laugh at you apparently. A family illness intervened. So did the weather (painting the back porch stairs has flown out the window, alas). A new writing assignment came my way, for which I’m extremely grateful. It’s been one of those weeks where nothing went quite as I expected it to. So, I’m trying to do something I’m woefully bad at: letting go. I’m attempting to let go of the stress over not getting everything done. Of the guilt for not being able to do any single thing with all my heart because my heart was in too many places at once. Of the need to do everything with what frankly amounts to an unhealthy need for perfection. I’m going to have a cup of tea. And I’m going to eat some of these very delicious grain-free chocolate chip cookies. And I’m going say the Serenity Prayer (or at least some secular version thereof) and try to accept that some things are completely out of my control—and that, in the end, that’s really okay. Sometimes, early readers can really stink. I know this because I’ve read, at this point, literally hundreds of them at all of the different levels. My daughter’s graduated to level three now, and is so proud of her reading prowess—as am I. But I’ve learned the hard way that the path to reading prowess is paved with a lot of really awful leveled readers. That is, until we discovered Emma. 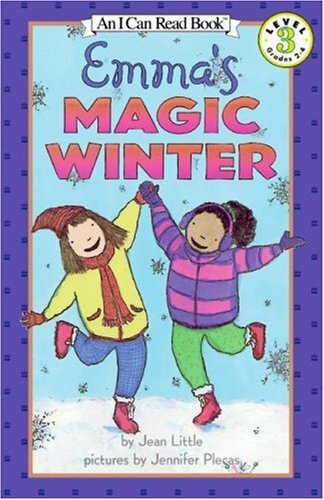 My kiddo first took Emma’s Magic Winter out of the school library, and she was immediately hooked. The story of a shy, anxious young girl who slowly comes out of her shell with the help of some “magic” boots and a new neighbor and best friend resonated with us. The problem is real, the solution is lovely, and overall effect is one that sweet but never soft—that reflects real life with still maintaining its magic. The same is true for the other two books in the series, which we’ve now ordered and read within an inch of their lives. Emma’s Yucky Brother. When Emma’s family adopts a four-year-old boy named Max, it isn’t a bed of roses for any of them. It’s hard for Max, it’s hard for Emma—there are some serious growing pains. But there’s also real love and real understanding. There are parents who stand by your side through thick and thin. And there’s a family who learns to adapt and grow in dear and unexpected ways. 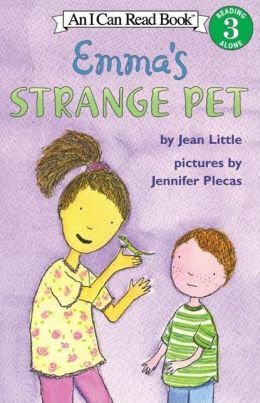 Another adoption takes place in Emma’s Strange Pet, but this time of a lizard (and eventually, two lizards). The story is as much about siblings learning to live together as it about loving and taking care of a pet (no matter how strange either siblings or pets can be). Each of these three stories tackles down and dirty family issues—each does so with grace, with affection for its characters, and with an understanding of the young reader that’s sadly rare in books of this type. So, if you’re looking for some lovely readers for your own little one, Jean Little and Jennifer Plecas have got your back. The view from under our birch tree, which makes lying in the new grass an even more appealing option than ever before. I’ve been busy. Work’s been crazy, the semester is just winding down for my MFA program, we seem to be attending the birthday parties of seemingly every child in our town this month. It’s just been plain, old busy. So, we haven’t had any time to take off to someplace fun and do anything terribly new or different of late, and if it were any other time of year, this would start to get to me. It’s not that I’m restless. It’s that I need a break. But when the break isn’t forthcoming, making the best of what you have makes all the difference. When you have a dear little yellow house surrounded by a sweet yard where everything is suddenly bursting back to life, it’s that much easier to make due with it all. So, we pick flowers for our first bouquet of the season. We wait for birds to move into our birdhouse (even though we know that with all the noise we make, they’re not actually going to come). As my husband recently pointed out, at least it’s pretty to look at! And we revel in the wall of forsythia that grows each spring beside our house. We take a break in our own backyard. Lying under our old birch tree, I find, gets me more relaxed than almost anything else does at this point. Which leaves me feeling less stressed, less harried…and more ready to keep writing. This week has not been a great one in terms of short-term well-being. I’m exhausted, allergic to apparently everything that grows, not feeling well, and today, have frankly been feeling a little sorry myself that I’m missing the SCBWI New England conference in Springfield. I should be thinking about writing today. Instead I’m lying on the couch. But to brighten an otherwise kind of awful week, these tiny gems arrived in the mail, ordered by my very amazing husband from I Hate Perfume after I posted about Christopher Brosius’s delicious-sounding perfumes last week. When I call them gems, I’m not merely talking about the tiny bottles, which are kind of adorable, but really about the scents themselves. They are extraordinarily complex, smell different on me than in the bottle, and are more soothing than I ever imagined any perfume could be. I’d never held much stock in the idea of aroma therapy (maybe because a lot of it makes me sneeze), but now I’m a believer. I’m wearing A Room with a View right now, and despite feeling a little bit low in body, in spirit I’m taking time to smell the violets—and to appreciate that when the going gets tough, my love has always got my back.